As today welcomes in the Chinese New Year, Year of the Snake, I thought that it would be fitting to review Rodial's Glamoxy Snake Serum. Rodial are renowned for their shock tactics and this includes the naming of their products. The Glamoxy Snake range is no exception. It's worth noting that no snakes were harmed in the making of this product- it is merely inspired by Temple Viper venom, a venomous snake that's native to South-East Asia, and the product contains "Syn-ake", a synthetic ingredient designed to mimic the venom's effects and which is intended to help minimise the appearance of expression lines. As with all Rodial products, the packaging is both chic and functional, with a handy and hygienic pump dispenser. Whilst the black packaging is signature to the Glamoxy Snake line, I didn't like that I was unable to tell how quickly I was going through the bottle. 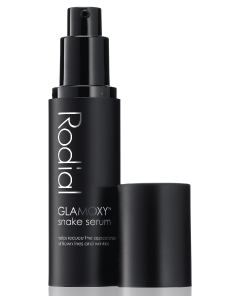 Rodial Glamoxy Snake Serum was easy to use- simply apply to a cleansed face and massage, paying particular attention to areas which are prone to expression lines, such as between the eyebrows, smile lines and eye contours. The serum had a rather liquid gel texture which lent itself well to a massage application. Furthermore, it didn't absorb instantly (as it can feel like with some serums) and this also encouraged the massage application. I liked that it's sufficiently lightweight to use around the eye area, as this is my main area of concern. A little goes a long way. After use, I could clearly detect a tightened feeling in my face and whilst it's not Botox, the appearance of expression lines was noticeably reduced, if only temporarily. I was also impressed at how plumped and hydrated my skin looked. I really feel that this is a results driven product that delivers impressive results and can't recommend it highly enough. The only downside is the price. At £127 for just 25ml, it's eye-wateringly expensive. As a mother of two I am in a constant battle between what I want and what our family budget says I can actually afford. I am always looking for a good bargain but there are some things, like my skin care, that I cannot compromise on! I've been a huge fan of Rodial products for years, but they can be pricey so thankfully one of my favorite sites, skinterra.com, is having a great sale right now! Right now they are having a sale for 22% off their entire store (not just iS Clinical!) PLUS for a limited time if you spend $75 or more they will give you a deluxe size of iS Reparative Moisturizer- for free! Everyone is raving about this moisturizer, so I can’t wait to try it. I'm telling everyone I know so you had better hurry to take advantage before they run out!